<?<FONT size=3> John Crandell III has been engaged in the sport of Endurance since 1976. 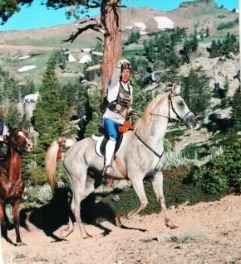 In 2006 John trained Heraldic to earn the first “Triple Crown” in the history of American endurance riding by winning the Old Dominion 100, The Tevis and the AERC National Championships and was honored with the “Best Conditioned Horse” award at each event. 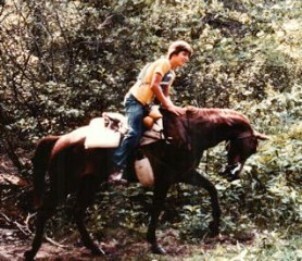 With continued success in 2007, John was named Chronicle of the Horse “Overall Horseman of the Year “. John has been a professional farrier since 1983. This has afforded him opportunities to serve as a shoeing and training consultant worldwide. John has participated as a rider or a staff member for the U.A.E and the U.S.A equestrian endurance teams for most world championships, and many other major international events since 1986. John has had a truly amazing career on the many horses he has trained and ridden. John and Heraldic are short listed for the 2011 Pan American Games in Chile. 2011: First and Best Conditioned in FITS 100 FEI*** on Heraldic in just under 8 hours. 2011: First, BC and High Vet Score at OCTRA (Canada) 75 FEI** on Heraldic. 2007: Chronicle of the Horse "Horseman of the Year"
2007: Winner of AERC Championship 100 on the Owynee course in Oreana, ID on Heraldic. 2006: Winner of the endurance "Triple Crown": Old Dominion 100, Tevis, and AERC Championship 100 on Heraldic, with BC at AERC Championship, and Hagin Cup at Tevis. Other Pre-2007 -- multiple wins, completions, BCs in rides competed in to each horse's capabilities.